The 14U Bakken Oilers are coached by Jarrod Olson. Players are from all across Western North Dakota and Canada, including Minot, Bismarck, Williston, Carnduff and the surrounding areas. The 14U Bakken Oilers are currently considering players for the 2015 AAA season. Based the skill level demonstrated in past performance, certain players will receive an automatic invite. Other players will have the opportunity to demonstrate their skills at an upcoming training/tryout camp. Please contact head coach Jarrod Olson by email through the Bakken Oilers website to be considered for the team. The U14 Bakken Oilers are proud to celebrate a successful innaugural campaign as the 2014 season comes to a close. After a successful 2013 boys AAA season (with several girls participating with the boys), the Bakken Oilers were eager to add girls teams to the program. 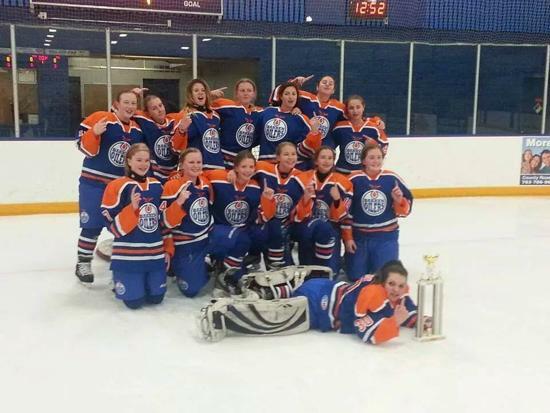 The U14 Bakken Oilers were a complete success with championships at the Mountain Dew Blast and the I.C. Freeze Out along with a 3rd place finish at the North American Pepsi Cup. The team and its head coach, Jarrod Olson, look forward to even greater success next AAA season.